Legendary RoaDog Motorcycle Now Lives At The National Motorcycle Museum! - Muscle Cars Zone! Legendary RoaDog Motorcycle Now Lives At The National Motorcycle Museum! The iconic Roadog motorcycle is engineered by enthusiast Wild Bill Gelbke. The production process lasted between 1962 and 1965. Only two examples were built making this legendary bike extremely rare. Gelbke was a guy who couldn`t find anything that suits his needs and style back in the days so he decided to make his fantasy a reality. He wanted something different and way bigger to be his personal ride. To create his dream motorcycle he opted to go outside motorcycling in order to find his ideal engine. That he managed to find in a four cylinder Chevy II car engine. The bike also features a cut down Chevrolet truck differential and a PowerGlide transmission. Gelbke had a lot of knowledge as he had an engineering degree. However, a lot of his massive knowledge was also gained by working at McDonnell Douglas located in California. His motorcycle building passion was so huge that he created several business some of them in Indiana and Illinois. This restless inventor had the desire to build a long distance, dependable cruiser. According to various sources, Gelbke managed to rack up 20,000 miles on the odometer during the first year of owning the RoaDog motorcycle. It`s also worth mentioning that teething issues were only few. However, after Gelbke`s death, the RoaDog was nowhere to be seen. However, only motorcycle enthusiast and publisher, Buzz Walneck, decided to go on a hunt and locate the legendary motorcycle. 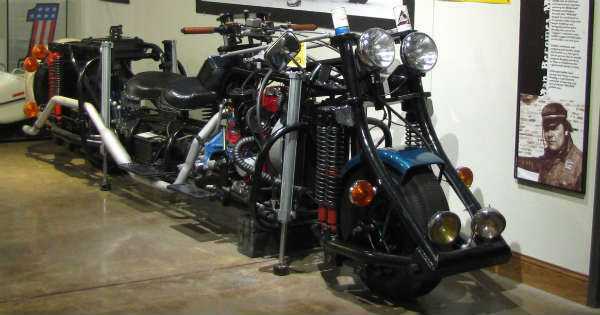 After some investigation and tips from his readers, Walneck managed to find the motorcycle safe and sound in Gelbke`s mother`s garage. Now, this iconic motorcycle is up for display in a Museum. And if you want to know which are the 50 most iconic motorcycles in history, follow this link!